When certain people think about defining themselves as high caliber poker players, they imagine scoring huge in large field tournaments. In both brick-and-mortar and online tournaments, it’s hard to match the excitement of going deep in an event with a gigantic prize pool. If you want to try this type of poker action, this article will go over some basic tournament information. Unless it is explicitly stated in the rules, you are not allowed to rebuy in a tournament. Players receive the same stack at the beginning of the event, and then it’s a game of survival. It costs a certain amount to buy-in to the tournament, and then a percentage of the field receives a prize once most of the players have been eliminated. The goal is, of course, to finish in 1st place and win the biggest prize for that tournament. Tournaments are different from cash games because the blinds go up according to a set schedule. Escalating blinds means that people are required to make moves to prevent themselves from blinding out (losing their stack to the blinds). This means that a tournament player must be flexible and adjust his or her strategy based on the size of the blinds and the player’s chip stack. If you are a skilled cash game player, you have the potential to do quite well in the early stages of tourneys. Everyone has a lot of chips and hands are rarely taken down pre-flop. You should be looking to accumulate chips without giving yourself the risk of busting. Some people play small ball, weaving in and out of several pots and winning a bunch of them. And then some people are patient, only playing their best hands and trying to make as much as possible when they enter pots. As people start busting and the average stack size increases, it’s time to think about the approaching money bubble. The strategy you use will depend on how successful you have been at accumulating chips. Possessing a large stack gives you the chance to put pressure on smaller stacks that are afraid of busting before making it into the money. If you have been struggling and find yourself with a smaller chip stack, you’re goal should be to double up. After the making it into the money, again your goal is to accumulate chips and make the final table. It comes as no surprise that some people will be gambling at this point in the tournament. Short stacks that were waiting around to make the money will be going all-in now. When everyone is gambling, big stacks have the advantage because they can wait around for good hands. Those are the basics that you should know before playing tournaments. To earn a profit in tourneys, you have to play a lot of volume because of the variance. And after all, they say that experience is the best teacher. Every poker player has been there. You flop a great hand and make every smart move that is possible throughout the entire hand only to have your opponent draw to a better hand on the turn or the river. No matter how great your hand might be, poker hands are only as good as what they will beat at a showdown. Knowing how to get away from a great hand when you know that you are beat is one of the skills that separate the champs from the chumps. The first step to knowing when to fold great hands is to avoid the mistake of becoming pot committed. Pot commitment occurs when a player feels he needs to defend the chips that he has already contributed to the pot, to the point that it affects his decision making. For instance, if a player lands a great flop and puts a great deal of money into the pot only to find that an opponent has probably gotten lucky along the way, it can be difficult to fold even when you know that you are likely beat. Not knowing when to fold great poker hands is particularly dangerous if you have gone on tilt. Even the best poker players degenerate into average gamblers when they are on tilt, and the desire to recover some of your losses can lead to bad calls even when a player knows that his hand has been cracked. It only takes one bad decision to seriously affect your winrate. When you get lucky and hit a great poker hand, it is important to remember that it isn’t over until somebody rakes in the chips. 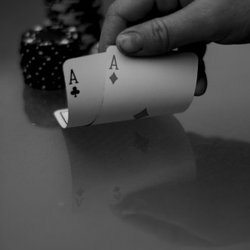 Even when you try to shut down a hand with a large raise, you will sometimes get called by an amateur who will get just plain lucky as the hand progresses. Remember, the money that you put into the pot is no longer yours, and there is no reason to get committed to the pot when you know that you are beat. In the world of poker, a smart lay down is just as respected as any other smart play.